Nobel Laureate Simon Kuznets, famous as the founder of modern empirical economics, pioneered the quantitative study of the economic history of the Jews. Yet, until now, his most important work on the subject was unpublished. This second collection of previously unavailable material issued by Transaction brings to the public, for the first time, the most important economic work written on Jewish migration since that of Werner Sombart a century ago. This volume of Kuznets' work includes three main essays. 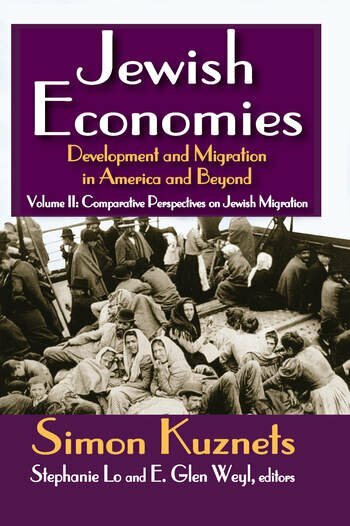 The first, titled "Immigration and the Foreign Born," was Kuznets' first work on immigration and discusses the impact of the general foreign born on the U.S. Kuznets and his co-author, Ernest Rubin, offer the essay as a quantitative antidote to the misinformation that led many Jews to support the restrictions ending Jewish migration in the 1920s. The second, "Israel's Economic Development," discusses the impact of mass immigration and other factors on Israeli productivity, providing in English for the first time one of the first detailed studies of the economic development of the state of Israel. The final essay, on "Immigration of Russian Jews to the United States," is the most famous of Kuznets' writings and provides a clear view, backed by a seminal paper that launched the contemporary social scientific study of Jewry. It discusses the details of the labor force, skills, and general structure of Eastern European Jewish immigrants to the U.S.